From my childhood to my 66, I have spent most of the time fighting against all kinds of diseases. Cancer is the first and severest disease that I have ever had. When I was told that I had cancer, I knew it is my time to grasp every second to struggle with death. You might think that I must be very scared within, but I am actually very relieved while talking with you. I want to say that I am a winner. The treatment gave me faith towards my family and attending doctor. They gave me great help. I trust my family. They always give me encourage and care. My dear younger brother and sister-in-law gave me great help and attentive care in my life. In June, 2007, I underwent cholecystectomy and was diagnosed with cholecystitis hyperplasia after the operation. In the following four years, my body was alright and it never occurred to me that the cancer would come back. in October, 2011, I frequently suffered from severe pain in the right upper abdomen. At first I decided to endure it and didn’t go to the hospital. My sister-in-law often went to my house and chat with me. She soon knew my condition and urged me to go to hospital for examination. The result came out and my Bangladesh doctor told me that it was poorly differentiated adenocarcinoma with liver metastasis. Hearing about this, my younger brother immediately arranged me to go to Singapore for another examination, which didn’t bring me any good news, but further confirmed the diagnosis as gallbladder stump cancer with metastasis to liver. Unlike most cancer patients, I accepted the truth quite calmly. The only thing I concerned was how to reduce my painfulness. However, the more I concerned the worse it came out. 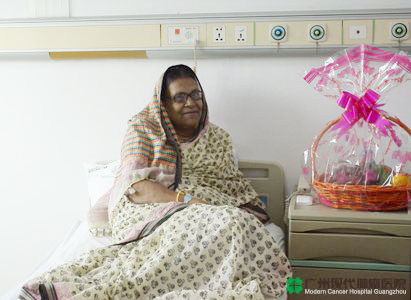 I went back to Bangladesh and underwent 6 sessions of chemotherapy, each of which almost killed me. The chemotherapy caused plenty of obvious side-effects, such as vomiting, hair loss, pain, loss of appetite and nausea. There was not a single minute that I want to continue the treatment. In May, 2012, I could not stand the painfulness any more and finally stopped the chemotherapy. At the moment, I was overwhelmed by negative emotion. Stop treatment? My condition will worsen very fast. Continue treatment? I may not be able to gain good treatment effect even if I determine to take the painfulness. My brother knew me well. He seek everywhere for treatment information and finally found the advertisement of Modern Cancer Hospital Guangzhou in a newspaper one day. He and his wife strongly recommended me to go to this hospital for treatment after comprehensive research on this hospital. My sister-in-law even told me that she would company me to travel to China and care for her during the treatment process in China. Trust China! People there are warm-hearted and technologies are advanced. June, I came to Modern Cancer Hospital Guangzhou under the companion of my sister-in-law. On our departure, my brother told me: “Trust China! People there are warm-hearted and technologies are advanced.” And it was proved true. I told my attending doctor Sun Jun about my fear of chemotherapy, he told me that their treatment is different from traditional chemotherapy. It is of less side-effect and much more effective than traditional chemotherapy. Later, the hospital started my diagnosis and treatment. The further examination revealed my condition of gallbladder stump cancer with metastasis to liver and left supraclavicular lymph nodes. Dr. Sun Jun arranged radioactive particle implantation for the cancer in the left supraclavicular lymph nodes and interventional embolism therapy for the liver. He said both the particle implantation and embolism therapies take effect targeting the cancer tissues, and will not affect my normal cells. Therefore, they will not cause toxic side-effect to the normal cells as what traditional chemotherapy do. Both the operations were very successful. It was amazing that I barely feel any pain. What was more reassuring was that the cancer had indeed shrunk a lot revealed by the return check. On October 3, 2012, I came back to Modern Cancer Hospital Guangzhou for follow-up check after 3-month rest. The hospital performed another treatment for me, which contained radioactive particle implantation aiming at the liver metastasis, radiofrequency therapy to the cysts around the liver, and natural therapy. I completely trust the treatment technology of Modern Cancer Hospital Guangzhou and hope that my condition can be improved obviously here. In this hospital, faces are always smiling, nurses are considerate. I have never had such relax and happy treatment before. 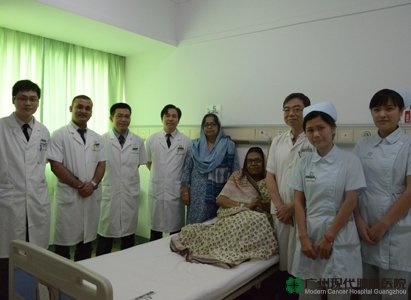 I always tell my brother and Bangladesh friends that I firmly believe my health will come back in Modern Cancer Hospital Guangzhou and that China will give me the most wonderful memory in my life.